"I'VE SEEN THAT PICTURE BEFORE SOMEWHERE..."
Yes, you most likely have seen this photograph at one time or another. It's become very popular over the years as an icon of sorts for various Renaissance festivals around the country. It's an excellent photograph of a jousting knight in action. It appears annually on billboards, newspaper advertisements, promotional materials, coupons and leaflets; some festival promoters have gone so far as to imprint this image (or hand-drawn reproductions or variations of it) on t-shirts, sweatshirts, mugs, posters, and even chocolate bars (!). In some instances it has been digitally altered to change the knight's colors from gold to red or blue. In fact, it is a photo of Hanlon-Lees founding member and part-owner Taso Stavrakis, taken at the Arizona Renaissance Festival a few years ago by photographer W. D. "Rusty" Wray. 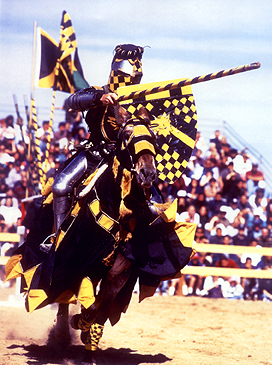 Taso takes pride in jousting in black and gold as he grew up in Pittsburgh, home of the Steelers; the wolf device on his shield represents his old companion Lassie, as fine a dog as ever drew breath. So what's the problem, you ask? The problem is that certain people have taken a great many liberties with this image - particularly in a marketing capacity - and use it year after year without honoring the creator of the image (Rusty Wray), the performer depicted therein (Taso), or the company represented (H-LAT). No remuneration or credit is offered to any of the parties involved; it's simply used as if it were in the public domain. It's not. Also, it may tend to give festival patrons the impression that they will be seeing a Hanlon-Lees performance when we are not in fact present at all, and we certainly don't want to take the credit (or the blame) for another company's show. This can get confusing, especially when the photo's colors are changed to match those of another company's jousters, or a rival company encourages one of their riders to dress in similar attire. The bottom line is: it's false advertising. The upshot of all this is please be aware that the use of this image to promote a particular event is in no way an indication that the Hanlon-Lees will be providing the entertainment. If you're not sure, please don't hesitate to check our appearance schedule to verify that we'll be appearing at that show. If it's not listed there... it's not us you'll be seeing. And if you happen to see this image being used somewhere -- please drop us a line, won't you? Thanks for reading. We now return to your regularly-scheduled website.